4Life Transfer Factor MalePro is an exclusive Targeted Transfer Factor® product, formulated to provide comprehensive endocrine system support for men. It works by promoting healthy prostate function as well as health in the reproductive and urinary organs. 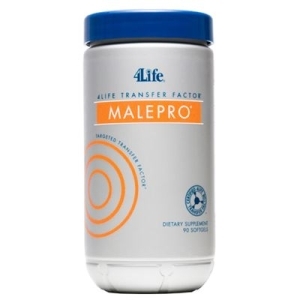 4Life Transfer Factor MalePro combines the immune-supporting benefits of Targeted Transfer Factor technology with clinically proven saw palmetto, lycopene, soy isoflavones and additional herbs and antioxidants that many researchers support as being an essential part of optimum prostate health. 4Life Transfer Factor MalePro contains all-natural standardized herb extracts to guarantee product consistency, quality and potency. Numerous studies have demonstrated the outstanding health benefits of saw palmetto relating to prostate health. Medical professionals throughout Europe have recommended saw palmetto to individuals who need additional prostate health support. This targeted MalePro formula contains the highest potency saw palmetto extract available today. The combination of saw palmetto, pygeum and nettle extract has been shown to be highly effective in supporting glandular system health. Research indicates that each of these herbs may be helpful in promoting healthy urinary function, health of reproductive organs and overall prostate health. Transfer factors are tiny messenger molecules that transmit immunity information from one entity to another, such as between a mother and her breastfeeding infant. These “smart molecules” support healthy immune responses, including the body’s ability to remember past health threats. 4Life Transfer Factor MalePro features a patented concentrate of transfer factors from cow colostrum and egg yolks to help support your immune system. 4Life Transfer Factor MalePro targets the superior immune-enhancing benefits of transfer factors to provide direct endocrine system support for men. 4Life Transfer Factor products are featured in the Physicians' Desk Reference: For Nonprescription Drugs and Dietary Supplements since 2003, the standard supplement guide for physicians that can be found in virtually every physician's office, hospital, and pharmacy in the United States. Numerous studies have demonstrated the outstanding health benefits of saw palmetto relating to prostate health. Medical professionals throughout Europe have recommended saw palmetto to individuals who need additional prostate health support. This targeted MalePro formula contains the highest potency saw palmetto extract available today. The combination of saw palmetto, pygeum, and nettle extract has been shown to be highly effective in supporting glandular system health. Research indicates that each of these herbs may be helpful in promoting healthy urinary function, health of reproductive organs, and overall prostate health. Zinc, a nutrient long known for its benefits in supporting prostate health, is included in 4Life Transfer Factor MalePro. Infection and other types stress have been shown to result in lower levels of zinc in the bloodstream and within the prostate. In addition, zinc levels are known to decrease in men as they age. The antioxidant benefits of lycopene and selenium are blended in this comprehensive formula to provide antioxidant protection from free radicals that cause oxidative damage to body cells and tissue.